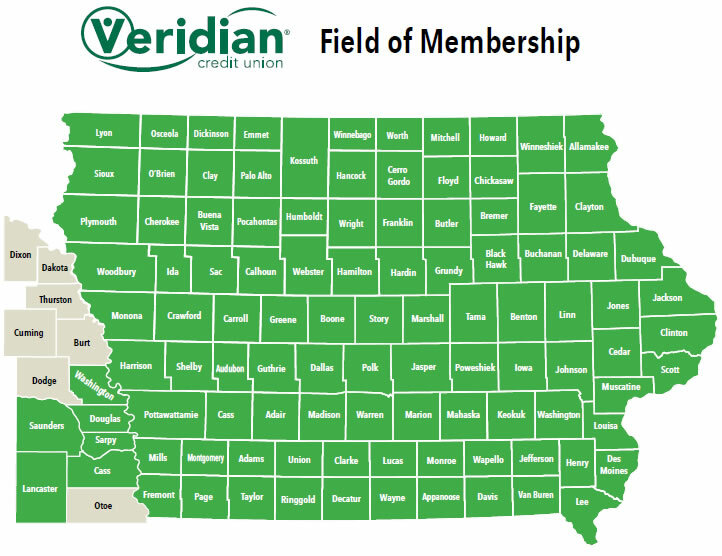 Who can become a member of Veridian? Individuals eligible for membership can extend the benefits to family members. This means that family members of an eligible individual may join as members in their own right, whether or not such individual is a current member. For purposes of eligibility, family members includes persons in the same household of the eligible member, and persons related to the eligible member (or spouse) by blood or marriage (Parents, Children, Grandparents, Grandchildren, Brothers, Sisters, Great Grandparents, Great Grandchildren, Aunts, Uncles, Nieces, Nephews, including step or foster children, adoptive children). Also eligible for membership at Veridian Credit Union are individuals with disabilities as defined by the Americans with Disabilities Act of 1990 who are living in the State of Iowa, and registered users of Dwolla. Our membership policy states "Once a member, always a member." This means you may maintain the full privileges of membership should you leave or retire from the company or association that offers you membership - even if you move to another area or state.